Planning a spectacular Theme Camp? Lekker – just be aware: registered Theme Camps aren’t just for you & your friends: they should offer some form of engagement to the citizens of Tankwa Town. Camps registered after the closing date can’t be included in our WTF guide or on the printed map, and may not get a space set aside for them at all. You’re still welcome to bring your camp, of course – it’s just that you would only be able to arrive after gates open on the Monday of our event, and then do your best to find the ideal location in Open Camping for your camp and its offering to the community. If you miss the registration deadline you’re welcome to come along to the Arteria at Off-Centre Camp at the event to alert our team to who you are and what you’re up to. Heads up: theme camp registrations for 2019 will close on February 28th. To Register your Theme Camp, click here to log into our site. 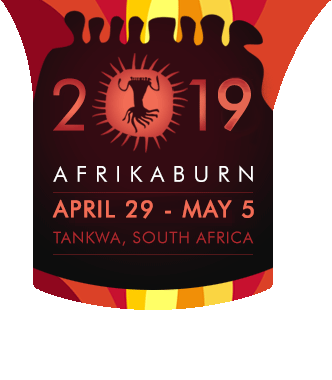 By completing and submitting this form, and/or buying a ticket to the event, you and/or your dependants, agents or their assignees, hereby indemnify AfrikaBurn and any of its members, employees, representatives, assignees and/or agents against any claim of whatsoever nature, howsoever arising including, without limitation, all and any claim/s for damages or loss of whatever nature, whether arising from negligence, gross negligence or any other cause, suffered by any person in connection with their attendance and/or participation at AfrikaBurn, in any action, not limited to action/s for damages or loss which might be instituted against them. You, your heirs, dependants, agents, executors or their assignees hereby irrevocably waive any claims which they may have against AfrikaBurn, any of its members, employees, representatives, assignees and/or agents for any form of claim for compensation, including but without limitation, claim/s for damages which they may suffer due to injury and/or loss of any nature whatsoever, including that emanating from negligence, gross negligence and/or wilful default, which includes accidents caused by your own actions; You hereby acknowledge that you will be responsible for any damage that may occur to any person or property as a result of your participation at AfrikaBurn.